In the nineteenth century, the area became known for its 'dialect writers' who created stories and poems in the local dialect. 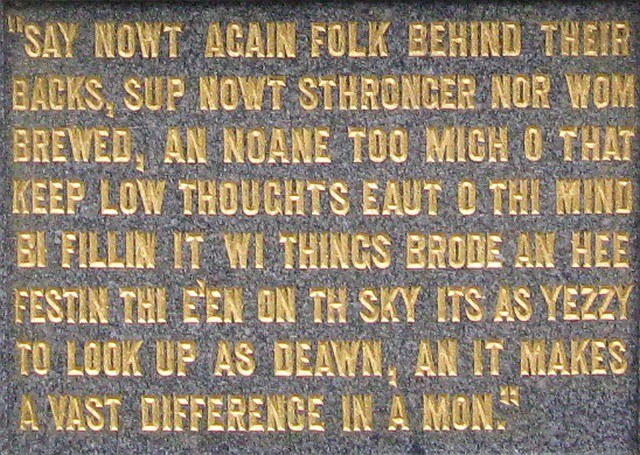 a version of English with a strong local accent and many of its own words. So it came about that in the 1890s local worthies had the idea of a memorial in Rochdale to four of these writers. One of the best-known, John Collier - 'Tim Bobbin' had already been commemorated by having his grave restored, and it was in 1892 at the ceremony in 1892 at St Chad's Church, Rochdale, to mark this restoration that the suggestion was first made by Archdeacon Wilson. 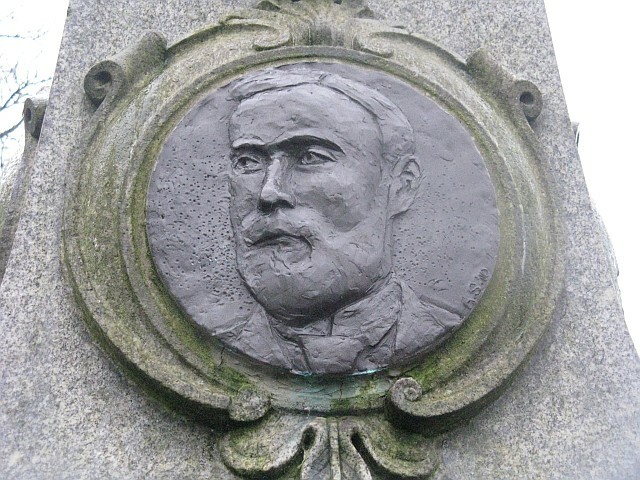 Following the deaths in 1895 of dialect writers John Trafford Clegg and Margaret Rebecca Lahee, a public meeting was held in Rochdale Town Hall in April 1896 and the project went ahead, the local architect Edward Sykes being commissioned to design the monument which was to incorporate portraits in bronze by John Cassidy. 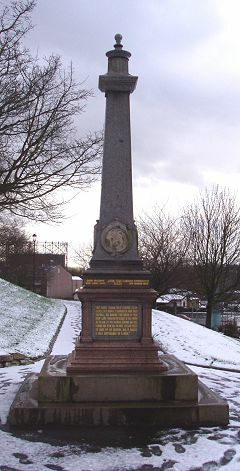 The chosen writers for the four sides of the monument were Oliver Ormerod (1811-79), Margaret Rebecca Lahee (1831-95), John Trafford Clegg (1857-95), and Edwin Waugh (1819-90). 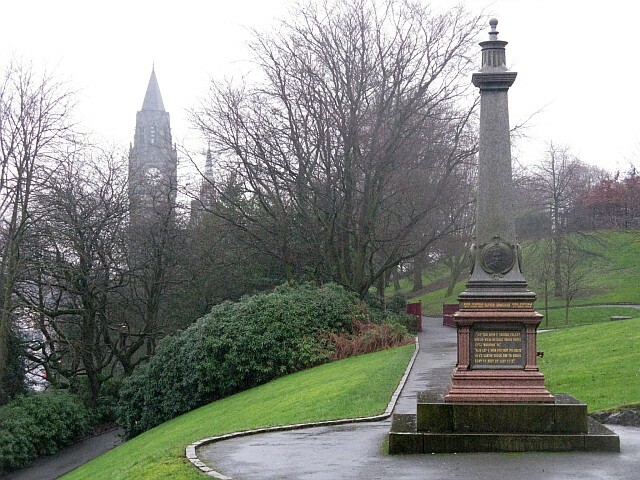 The location was, and is, the slopes of Broadfield Park overlooking the town centre, and it was completed in 1900. 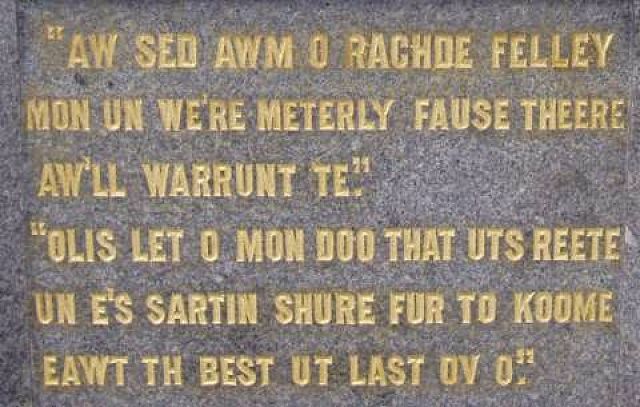 The Lancashire Dialect Writers' Memorial Public Monument and Sculpture Association National Recording Project website. William Henry Crossland, 1835-1908. Town Hall architect. Website by Edward Law. 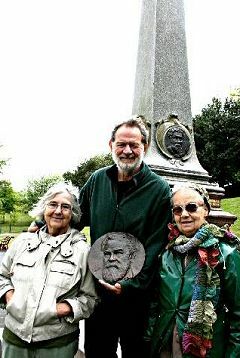 An important monument commemorating historical writers from Rochdale has been restored thanks to an artist and friend of Broadfield Park. 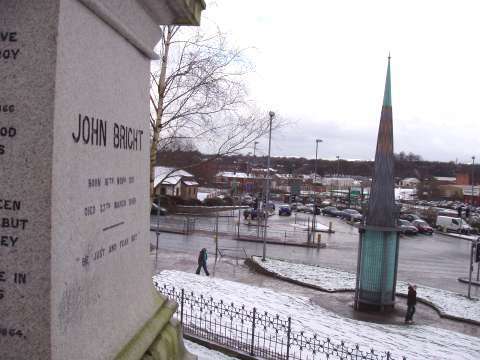 Commemorative bronze plaques were stolen almost 18 months ago from the Dialect Writer’s Monument which stands strikingly in Broadfield Park. After an appeal for the plaques to be found or returned failed, a member of the Broadfield Park’s Friends’ Group offered his artistic services to recreate the plaques. Tony Smart from Rochdale has spent the last 12 months creating the new plaques which feature portraits of the famous writers; Edwin Waugh, John Trafford Clegg, Margaret Rebecca Lahee and Oliver Ormerod. Mr Smart’s new gift to Broadfield Park was fixed onto the monument on Thursday 12 May 2011 coinciding with the Green Flag judges paying the town a visit to determine whether the borough’s favourite parks retain their prestigious Green Flag status. Mr Smart said: “I feel extremely privileged for this opportunity to help restore such a precious local monument back to its former glory. I’ve been a friend of Broadfield Park for 15 years. 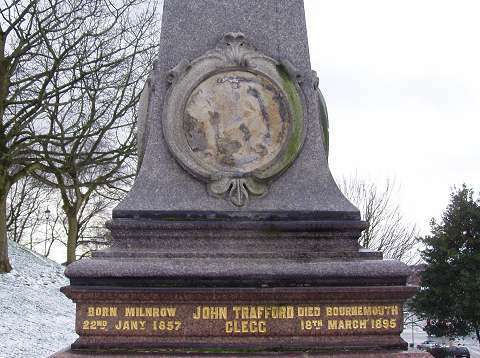 “I hope my gift will be equally appreciated by the local community and visitors.” An important monument commemorating historical writers from Rochdale has been restored thanks to an artist and friend of Broadfield Park. Tony Smart from Rochdale has spent the last 12 months creating the new plaques which feature portraits of the famous writers; Edwin Waugh, John Trafford Clegg, Margaret Rebecca Lahee and Oliver Ormerod. Mr Smart’s new gift to Broadfield Park was fixed onto the monument on Thursday 12 May 2011 coinciding with the Green Flag judges paying the town a visit to determine whether the borough’s favourite parks retain their prestigious Green Flag status. Oliver Ormerod, by Tony Smart. The damage to the frame suggests that the original was chiselled off. 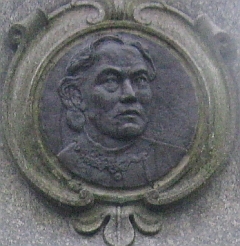 Margaret Lahee, by Tony Smart. 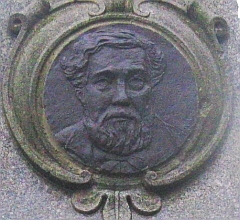 Also in Broadfield Park: George Leach Ashworth, by W. & J. Wills. With Councillor Edward Taylor, Ashworth, who was twice mayor of Rochdale, was largely responsible for acquiring the 16 acres that form the park. 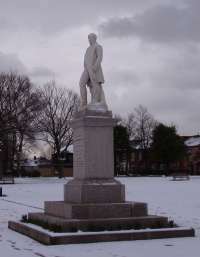 Ashworth's statue (above) was unveiled on 1 June 1878. Harvey Kershaw was born in Rochdale in 1908, son of Robert and Mary Kershaw. Robert worked as a carter for the Rochdale Pioneers Cooperative Society. The 1939 register finds Harvey working as a warehouseman in the printing industry. He received the MBE in 1974 for his services to the writing, preservation and recitation of Lancashire Dialect and verse. His wife Mary often sang whilst Harvey played the piano; their LP 'Lancashire sings again' was released on appears on for the Topic label. Their work inspired other folk singers including The Oldham Tinkers. Harvey died in 1986; we have failed to find online any obituary of life story, which seems unforgivable. YouTube video: The Oldham Tinkers sing The Peterloo Massacre written for them by Harvey Kershaw. on 't field of Peterloo. 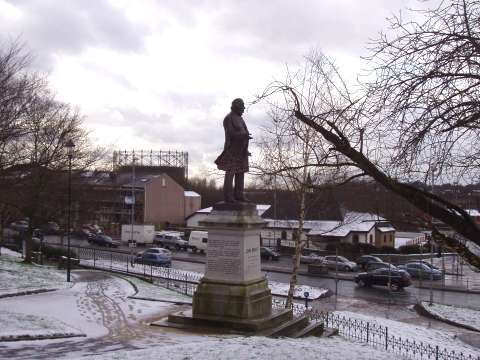 Our visit to Rochdale in January 2008 was the day after a light covering of snow had whitewashed the town. 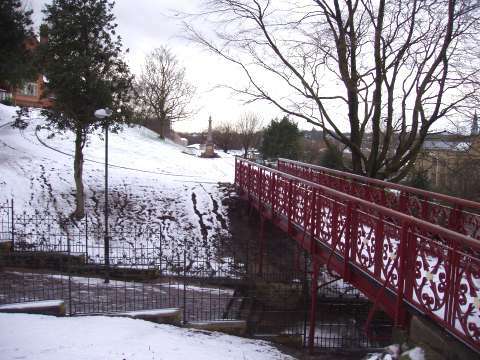 This is Broadfield Park, looking good after refurbishment in 2007, with the Memorial in the distance across the footbridge. 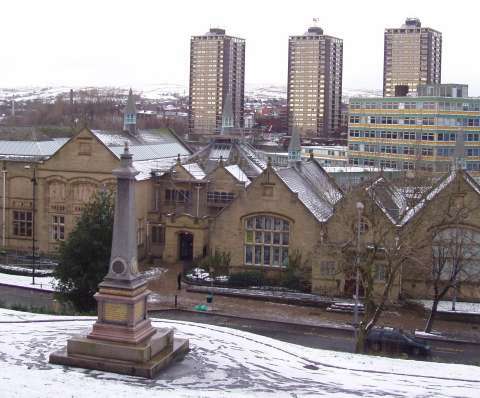 Above, the view from Broadfield slopes, with the Lancashire Dialect Writers' Memorial looking over the buildings of 'Touchstones', the town's excellent museum and art gallery, with some more modern structures behind. And here are the quotes from his work in its granite panel below. This sort of writing looks very strange, but some of the strangeness is the result of attempts to render the Lancashire accent phonetically for users of standard English. The second says "Always let a man do that what's right and he's certain sure for to come out the best at last of all." Sadly, at some time which has gone unrecorded, Cassidy's picture of John Trafford Clegg had been removed by person or persons unknown. At some date after our visit, two of the others were stolen. Rochdale-based sculptor Tony Smart, a member of the Broadfield Park’s Friends’ Group, undertook to make replacements at his own expense - with help from the pictures in this feature. The replacements were unveiled were unveiled on Thursday 12 May 2011. We revisited the site on a rainy day in 2016: Here's Tony Smart's version of John Trafford Clegg. Clegg's quotation comes from a character in his story 'Lijah's Fortin' published in serial form in the Rochdale Observer and reprinted after his death in the anthology The Works of John Trafford Clegg published in 1895 by The Aldine Press, a firm run by his brother James, to whom he was apprenticed, later working in a Cotton mill before returning to the printing business. The book is available to read on the Archive.org website. John Trafford Clegg dies in Bournemouth aged just 38. The red stone is Peterhead granite from north-east Scotland, a favourite material for gravestones, and the carved and gilded lettering also looks like the work of a monumental mason. 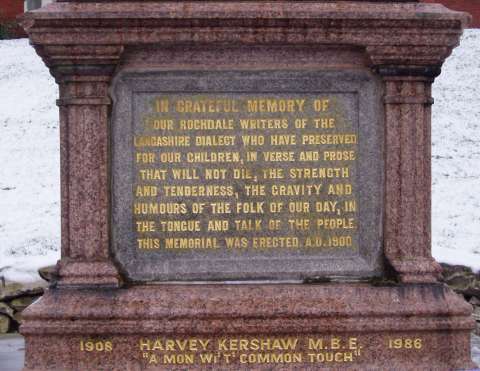 In 1987, as seen above, the name of Harvey Kershaw, a Lancashire poet of a later generation, was added to the memorial, making him the only person commemorated by the works described on this website whom we have actually seen in person. His song about the 'Peterloo massacre' of 1819, written for the Oldham Tinkers was a favourite with singers in the folk clubs we used to frequent. It stood in the Town Hall Square until a road improvement scheme in 1933; a proposal by the Council in 2005 to return it to the square in 2005 was abandoned for risk of damage to the statue. John Bright gazes down on to some public art from a different age: 'Spires.' This comprises two similar spires (made of green slate, blue glass and steel) either side of a junction of main roads, one of which is seen here. Designed by Jem Waygood and erected in 1997, they predictably brought forth scorn of the kind which always seems to attend modern sculpture. A poll conducted by the Rochdale Observer found that 73 per cent of callers agreed with editor Martyn Green's view that they were 'pathetic, and a complete and utter waste of money.' A rather extreme reaction, you might think, to such inoffensive objects. By 2005, they had fallen into a neglected and vandalised state and £10,000 had to be allocated for their repair. Looking towards the town centre in this 2016 view, we see the tower of Rochdale's greatest landmark, the Town Hall, designed by Yorkshire architect William Henry Crossland. 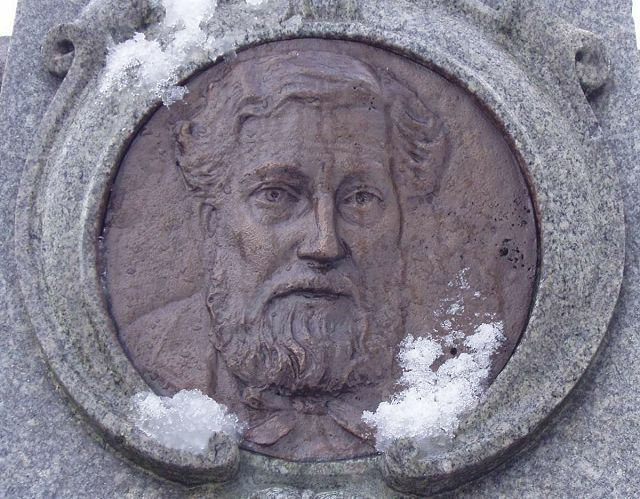 The foundation stone of the building was laid on 31 March 1866 by John Bright, and the local paper reported 'We shall indeed have something more to boast of than Tim Bobbin's grave'. It was completed in 1871; Crossland's design was chosen by a competition based on a building which was to cost not more than £20,000 - in fact it cost more than £150,000. The clock tower, designed by Alfred Waterhouse, replaced the original wooden version, which had a wooden spire, in 1887. Written by Charlie Hulme, February 2008. Updated January 2019.